A good dartboard offers a number of handy and professional features that most budget options lack. More than anything else, the best dartboard allows you to play the game without the worry of darts bouncing off of the wires or edges. That is why the top pick on this list is where it is: great durability and customization come together in a protected cabinet to offer you an excellent playing experience. The Viper Hudson Dartboard is an all-in-one dartboard bundle that comes with everything you need to get up and playing. This is a great choice for first-timers and experienced players alike since it is easy to set up and start playing right off the bat. 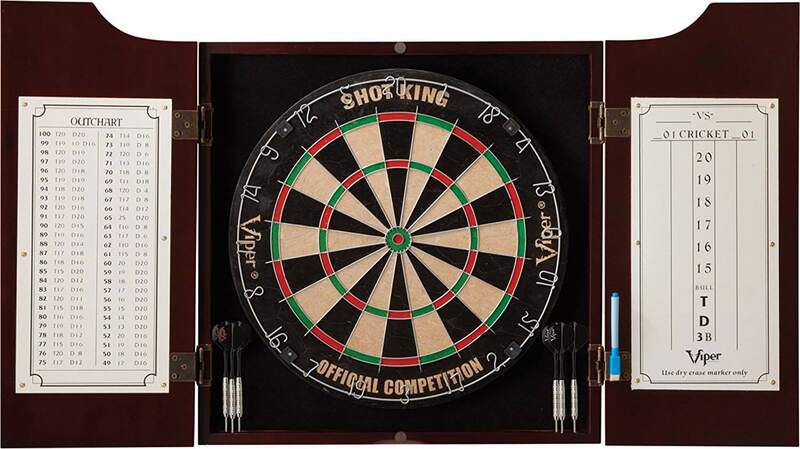 Coming with a dry erase board for scorekeeping and different premium versions with better darts, everything is contained within a protective cabinet that folds up for easy carrying. When you are looking at budget options for a dartboard, you have to make some sacrifices. It is difficult to get a durable board protected in a cabinet with luxury accents. Instead, you have to prioritize the necessities over the extra perks. In short, you need a dartboard that will self-heal and allow you to use different areas of the board in rotation so you are not causing permeant damage so soon. The Viper Razorback Dartboard is a basic dartboard that is perfect for beginners or anyone needing an inexpensive replacement board. The sisal bristle is self-healing so you can keep using the board for years before needing a new one. Choose between steel and soft tip darts depending on your playing style. For more longevity, the removable number ring can be rotated to promote self-healing. For extra protection and an added level of elegance, a dartboard housed in a wooden cabinet is the way to go. A well-built cabinet will keep the dartboard out of sight and away from dust when not in use. The extra space a cabinet offers can also hold a dedicated scoreboard and holders for darts so you are not losing precious equipment each time you go to play a new game after a long break. The Trademark Games Dartboard is the ultimate option to choose when you want a dartboard that looks classy and elegant in any room. Coming in a solid wood cabinet with a curved top, the surface is durable and modern. On the inside, you will find a high-quality dartboard with removable number ring and placeholders for six steel tipped darts. The cabinet is easy to hang and secure on virtually any wall space you may wish. While playing darts is not the most complicated task in terms of keeping the score, an electronic dartboard can make life a little easier. In addition to advanced, sometimes automatic scoring features, electronic dartboards also come with extra perks their analog counterparts lack. 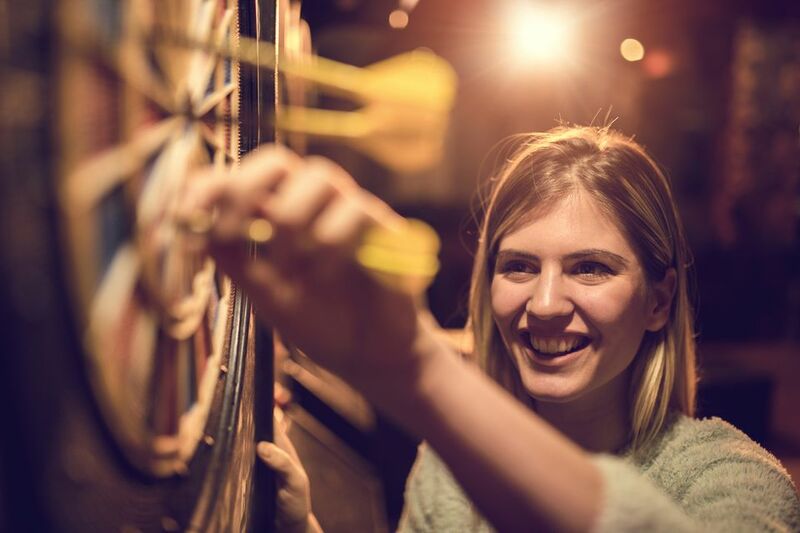 From practicing drills to fun games and solo play, an electronic dartboard is something to consider if you do not need a pure, traditional playing experience. Offering the benefits and convenience of most electronic dartboards, the Arachnid Electronic Dartboard also offers a little bit of extra protection normally found on high-end cabinets. The outer cabinet sports two folding doors with room for twelve individual darts. The electronic features of the dartboard include an LED scoring display, solo scoring/gameplay, and 38 individual games for some variation. The whole board is powered by a standard AC wall adapter so you can plug it in and hang it virtually anywhere. It is no secret that darts have an inherent risk in the gameplay. When you are flinging sharp tipped projectiles around, the possibility of injury is always there. If you do not want to expose young children to this risk, the best thing is a dartboard specifically designed for safe and fun gameplay. While you will not get the same level of gameplay as the real thing, a kid-friendly board is the perfect way to have some family time fun. To keep play safe and fun, the Marky Sparky Doinkit Dartboard does away with the traditional soft or steel-tipped darts and uses a magnetic head/board combination instead. As a result, the darts are larger and easier to use without the worry of someone getting hurt. The board is sized accordingly so the rules and gameplay remain the same as the real thing. The darts come in different colors and are flexible so they will not break. Playing darts is usually done inside where the only thing that threatens the quality of the board is the game itself. Outside, however, is a different story. Weather alone can quickly destroy most dartboards if left unattended. Even boards protected with a wooden cabinet may not fair so well if they aren’t protected from moisture and other more invisible weather elements. To play outside, you need a dartboard designed to survive outside. The RaboSky Roll-up Magnetic Dartboard might not look like your typical dartboard, but it will get the job done if you want to keep something outside in the yard or on the patio regardless of the weather. Using magnetic heads and a roll up magnetic board, the board can withstand the abuse of being outside without the extra bulk of a cabinet. Best of all, the magnetic heads make the gameplay safe for small children as well. The game of darts can take years to truly master, but it can be more beginner-friendly with the right board. This type of board makes it easy to learn the basics of the scoring and throwing technique on a surface that does not take professional-level skill to hit. Best of all, most beginner-friendly boards, including this next one, are friendly to the wallet as well. The Winmau Bristle Dartboard will not make you a star player overnight, but if you are new to the game, it will lower the challenge a bit. With an increased scoring area due to thinner wiring, it is easier to land your darts onto the intended target. The board is extremely durable as well so you can miss without the worry of creating any unintended holes around the edge of the board itself. Sometimes, it is nice to show a little pride in your favorite sports team any way you can. If you are a lover of both darts and football, this next dartboard is just for you. Offering the same level of quality and gameplay as other high-end options, this board also gives you a chance to display the colors and logo of your favorite sports team from the National Football League. To proudly display your team spirit, the Imperial International NFL Themed Dartboard will display one of 28 NFL team logos right on the folded front of the cabinet doors and scoreboard. In addition to the team markings, the cabinet contains a fully regulation-size scoreboard and dartboard for standard gameplay. Six metal darts fit within the pine cabinet, remaining safe and organized until the next time you are ready for an exciting game.